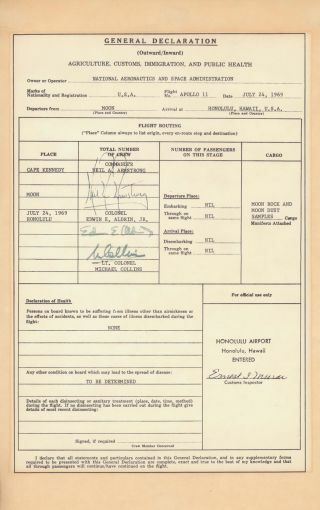 A copy of the U.S. Customs form filled out by Apollo 11 astronauts Neil Armstrong, Buzz Aldrin and Michael Collins after their return to Earth on July 24, 1969. Before the ticker tape parades and the inevitable world tour, the triumphant Apollo 11 astronauts were greeted with a more mundane aspect of life on Earth when they splashed down 40 years ago today - going through customs. Just what did Apollo 11 astronauts Neil Armstrong, Buzz Aldrin and Michael Collins have to declare? Moon rocks, moon dust and other lunar samples, according to the customs form filed at the Honolulu Airport in Hawaii on July 24, 1969 - the day the Apollo 11 crew splashed down in the Pacific Ocean to end their historic moon landing mission. The customs form is signed by all three Apollo 11 astronauts. They declared their cargo and listed their flight route as starting Cape Kennedy (now Cape Canaveral) in Florida with a stopover on the moon. The form was posted to the U.S. Customs and Border Protection Web site this week to mark the Apollo 11 mission?s 40th anniversary. A copy was obtained by SPACE.com and verified by NASA. ?Yes, it?s authentic,? NASA spokesperson John Yembrick told SPACE.com. ?It was a little joke at the time.? It?s more humor than fact because Apollo 11 splashed down 920 miles (1,480 km) southwest of Hawaii and 13 miles (21 km) from the USS Hornet, a Navy ship sent to recover the crew. It took a two more days for the astronauts to actually return to Hawaii on July 26, where they were welcomed with a July 27 ceremony at Pearl Harbor. The catch? The astronauts were trapped inside a NASA trailer as part of a quarantine effort just in case they brought back any germs or disease from the moon. They even wore special biological containment suits when they walked out on the deck of the USS Hornet after being retrieved. Today, NASA astronauts still have to go through customs, but for more conventional reasons. Astronauts on missions headed for the International Space Station must train in Japan, Canada, Europe and Russia in order practice with the different systems, modules and tools they?ll use while visiting the outpost, which is the end result of 10 years of space construction by 16 different countries. NASA?s shuttle Endeavour and a crew of seven spaceflyers are currently docked at the station today, where they delivered a Japanese-built experiment porch. Space station crews launching on Russian Soyuz spacecraft have to make their way to the Central Asian spaceport of Baikonur? Cosmodrome, which is in Kazakhstan. No matter what the mission, even astronauts have to go through customs, NASA officials said. As part of their routine airline flights to other countries and back, they of course encounter airport customs. ?The do have a government passport, but they do have to go through customs,? NASA spokesperson Nicole Cloutier-Lemasters told SPACE.com. ?Just like the rest of us. ?